Yesterday we got a new trailer. 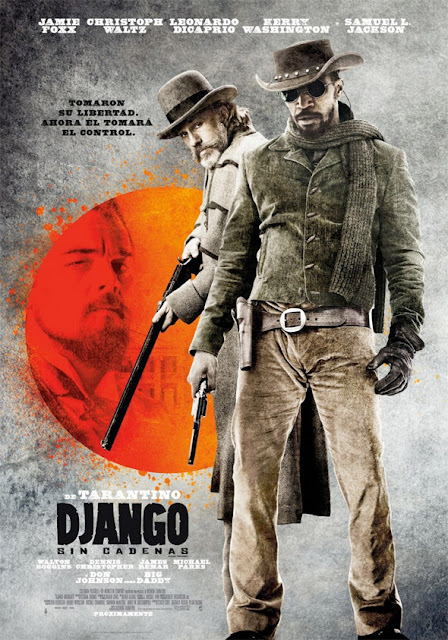 Today there's a new Spanish poster for Quentin Tarantino's upcoming Django Unchained. The main cast are here and it's something of a departure from the bold red and black previously released UK poster. Jamie Foxx, Christoph Waltz and Leonardo DiCaprio all feature on the poster with Leo's villain being all menacing in the background of the scorching red blood splattered sun. The Western iconography is to the fore with costumes and guns on display. It's Django's shades that keep the cool factor. The release date is set for 18 January 2013 in the UK so expect much more in the way of marketing materials before we finally get to see the film. Read more on the new poster over at Filmoria. The trailers just keep getting better and better for the film with this latest offering more of a glimpse at Leo as the big bad villain and a bit more of the funky music, funny dialogue and potential for bloody violence.